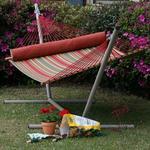 Stop and smell the roses in the Large Trellis Stripe Quilted Fabric Hammock. This season, trends in hammock colors include cool, but vibrant blues coupled with bright greens. 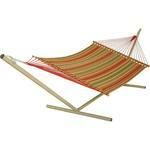 The looks of rich old-south gardens come to life in the Large Trellis Stripe Quilted Fabric Hammock. 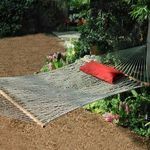 Lush florals and foliage, regal quality, vintage tapestry and mosaic weaves indicative of garden walkways have been crafted into this hammock. 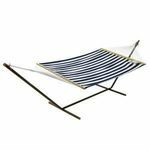 It is made with quilted DuraCord fabric, oak spreaders and zinc-plated hardware. 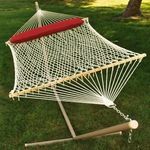 Color is not often the first thought, but this is not your grandmother's hammock anymore. 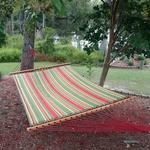 Colors are exploding in fabrics that are used in various hammock styles. 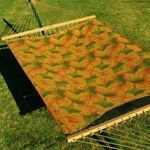 With the advancements in solution dyed yarns, those that do not fade in the outdoors, colorations are unlimited in hammock fabric designs. 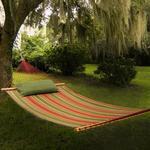 This season, trends in hammock colors include cool, but vibrant blues coupled with bright greens. 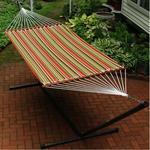 Outdoor also continues to welcome the olive greens matched with warm deep burgundy or rich oranges. 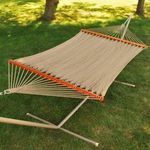 Whatever the color however, keeping it from fading in the sun and elements and retaining its intended coloration is key. 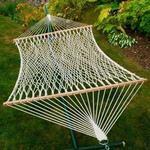 Large Quilted Fabric Hammock Item No. 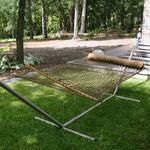 QGN01 Bathe yourself in cushioned comfort with a Pawleys Island Quilted Hammock. 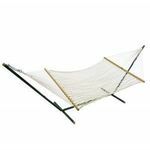 Offering the ultimate in luxury lounging, quilted hammocks offer an inch of polyester batting surrounded by durable solution dyed DuraCord fabric®. 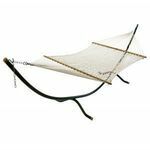 DuraCord® is a revolutionary fabric that is as soft as cotton but has the durability of polyester. 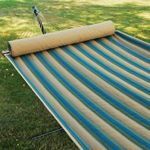 Rust-free decorative brass grommets evenly span the fabric bed. 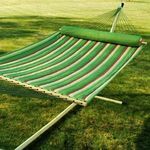 The spreader bars are constructed of premium solid oak for durability and strength and specially designed to enhance a gentle sway. 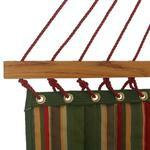 Included is superior constructed hanging hardware. Heavy duty zinc chromate hardware resists rust and is the largest in the industry. 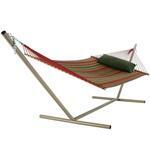 Dimensions: 55” x 82” body, 13’ long Accommodates two persons. An attractive soft twill woven stripe fabric.